Also known as the Pygmy Anteater, the Silky Anteater is the smallest anteater on Earth. It is truly tiny: only 20 cm in body length with a long, furred, prehensile tail up to 24 cm in length, and weighs in at under a pound. It is named for its silvery gray-gold fur. It has a dark stripe running down its back from shoulders to rump. Its underside is a creamy yellow color. Its fur is dense and slightly wavy. Unlike other anteaters, it has a short snout and no visible ears – they are tiny and concealed underneath its thick fur. Each of its forefeet has 2 large claws, and its hind feet have 4 small claws. Nocturnal and arboreal, this very unique mammal is rarely seen, but is likely more common than it leads on to be, due to its elusive nature. During the day, it curls itself up into a small ball of golden fur and tucks away into dense vine tangles to rest. It is active after dark until an hour or two before sunrise. It travels slowly through the forest mid-story along small branches and lianas. It has specially designed hind feet with a tight fold in the skin for grasping small branches and vines. Silky Anteaters forage for ants, their primary food source, as well as other insects along small branches and hollow stems. They use the powerful claws on their forefeet to tear open the branches and lick up the ants with their long, sticky tongues. They are known to eat up to 5000 ants in a day! Females and males occupy different home ranges. Male home ranges are larger than those of females and will overlap with the home ranges of several females. Females give birth to one young at a time, and may breed two times per year. The mother will leave her young on its own in the safety of a vine tangle or nest while she forages at night, then moves it to a new location before dawn. Silky Anteaters are generally solitary. If threatened, they will rear up on their hind legs and raise their forelegs to their face, and if close will strike and pinch the attacker with their strong claws. They are usually silent, but are known to make a soft whistling sound. Silky Anteaters are known to use Ceiba trees to roost, as they are thought to camouflage with the tan-colored fluffy seed pods of the tree, allowing them to avoid predation by raptors. The Silky Anteater inhabits lowland and foothills forests up to 1500 meters elevation. It prefers humid rainforest, secondary growth woodlands and mangroves, where it can be most commonly encountered. Throughout its large range, it has many local names. In Panama, it is known as “gato balsa” and “tapacara” – “tapa” meaning lid or cover and “cara” meaning face in Spanish, for its behavior of covering its face when threatened. In other countries, several of its local names translate to “little angel.” The genus Cyclopes means “circle foot,” referring to its specially-adapted hind feet that wrap completely around the branch; Didactylus means “two-toed,” for the two large claws on the forefeet. Silky Anteaters are widely distributed throughout tropical America and can be found from Mexico south throughout Central America and throughout most of the Amazon basin to central Brazil and Bolivia. 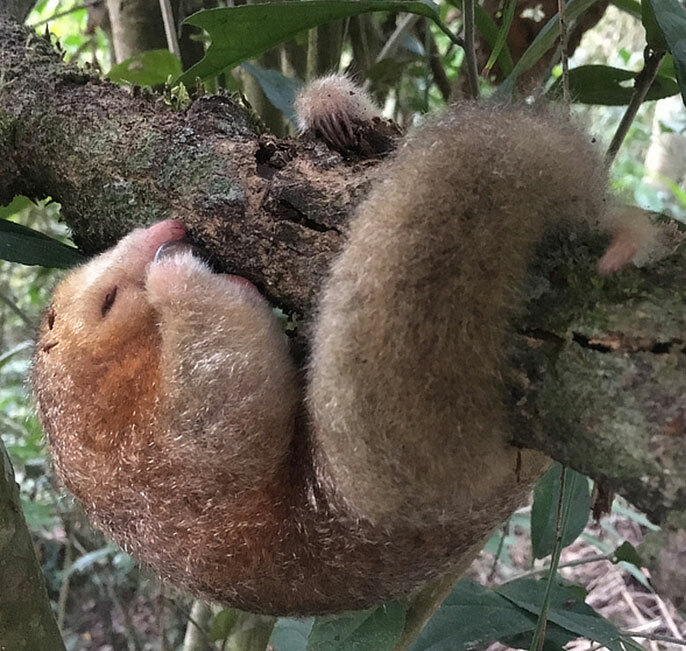 New species: There is much variation in the color of the fur in Silky Anteaters throughout its widespread distribution. Recent taxonomic studies (2017) suggest through molecular analysis that there could be seven new species of Cyclopes silky anteaters that deserve to be recognized. Read more about this discovery in this Nat Geo article.